According to the National Institute of Drug Abuse, though traditionally associated with white, male blue collar workers, methamphetamines are now reportedly being used by diverse groups in all regions of the country. Overall usage: The Substance Abuse and Mental Health Services Administration, 2017 Annual Report National Survey on Drug Use and Health indicates that 800,000 persons 12 years and older used methamphetamine during the month of January 2017. Overall, the number of methamphetamine-related emergency department (ED) visits rose from 67,954 in 2007 to 102,961 in 2011, with similar patterns seen for males and females. 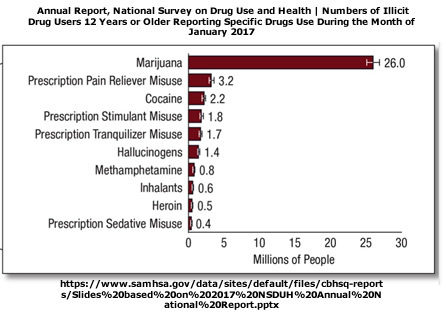 In 2011, about one fifth (22 percent) of methamphetamine-related visits involved combinations with marijuana, and one sixth (16 percent) involved combinations with alcohol; these were the same top two drug combinations found in 2008. Of all methamphetamine-related ED visits in 2011, about 6 in 10 (64 percent) resulted in patients being treated and released. Use among youth: National Institute on Drug Abuse, Monitoring the Future Study: Trends in Prevalence of Methamphetamine for 8th Graders, 10th Graders, and 12th Graders; 2018 (in percent)*. The 2018 Monitoring the Future (MTF) survey of adolescent drug use and attitudes reported that about 1 percent of 8th, 10th, and 12th graders had used methamphetamine within the past year. Emergency department statistics indicate that males and females have about the same rate of meth associated ER use? U.S. Department of Health & Human Services. Substance Abuse and Mental Health Services Administration. The Drug Abuse Warning Network (DAWN). Emergency Department Visits Involving Methamphetamine: 2007 to 201.